It was great to be able to be part of today’s launch of the Northern Rivers Joint Organisation (NRJO) Strategic Regional Priorities for 2019-2022. 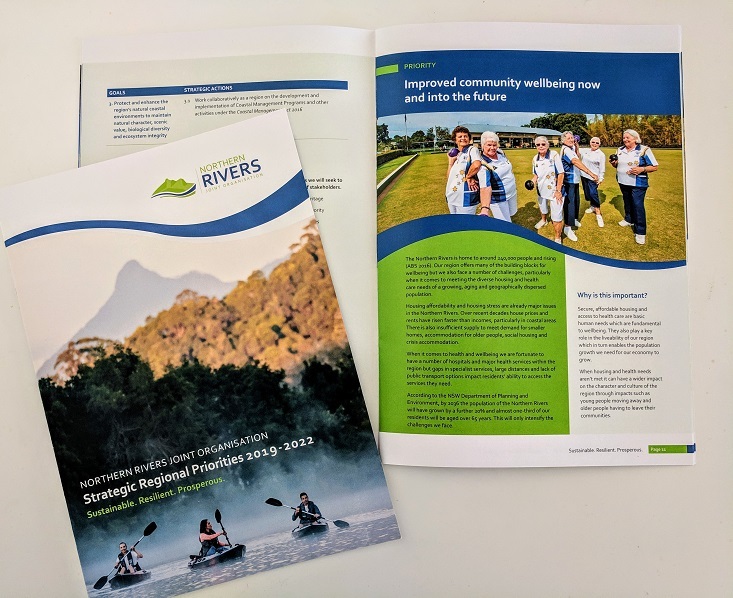 Muller Enterprise worked with NRJO for more than six months to develop this important document which outlines a vision for the Northern Rivers region, five strategic priorities and the actions the Joint Organisation will pursue in each priority area. Speaking at the launch, NRJO Chairperson and Kyogle Mayor Cr. Danielle Mullholland said the plan had already provided a platform for NRJO to identify the key projects it will pursue this year on behalf of the Northern Rivers community. All copywriting and overseeing the visual design and print of the finished document. Whether you’re a small business, not-for-profit or community organisation, having a good strategic plan isn’t a nice-to-have – it’s an essential. Muller Enterprise can guide you through the strategic planning process from beginning to end, conducting workshops, consulting stakeholders and crafting practical, actionable plans that will help your organisation get from where it is now to where it needs to be. If you’re failing to plan, get in touch and we can help you plan to succeed.